Humanities were under the spot light at The Sixth Form College, Solihull this week as an eminent professor from the New College of the Humanities in London visited to talk to A level students. 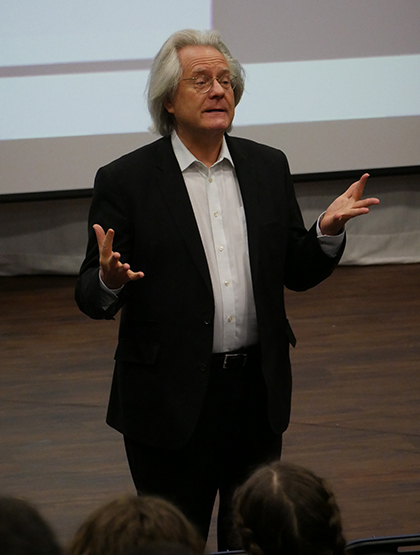 Professor Grayling addressed a lecture theatre full of students from Geography, History, Ancient History, Classical Civilisation, Politics, English, Religious Studies and many other A level courses. In what was a university-style lecture, the professor explored what the study of Humanities entails, incorporating references to literature, philosophy and even science to make his point. He spoke of its importance not only in terms of the value placed on it by employers, but also in terms of creating analytic thinkers and the benefits that brings to individuals and the wider society. Questions were invited by students at the end of the talk and from this the discussion expanded to include religion, sexism and even the way developing technology (including robotics and artificial intelligence)impact on the study of Humanities. Professor Grayling is a Professor of Philosophy, an author of over thirty books, a newspaper columnist and a broadcaster. He has twice been a judge on the Booker Prize and is a Vice President of the British Humanist Association, a Fellow of the Royal Society of Arts, and a Fellow of the Royal Society of Literature. He has invited the College to bring a group of students to the New College of the Humanities in London for a workshop in the near future.